These Light Gray support angles are manufactured in 14-gauge steel and are designed to support S Series shelves. They mount to side legs of panel mounting angles. Rubber cushioned, swivel base levelers are non-marking, non-skid and absorb vibration. Cushions are 11/2 inch diameter and 5/8 inch thick. Adjusting stud is 1/2 - 13 thread. Set of (4) is supplied with mounting brackets and all necessary hardware to mount under Trimline or Spartan Base. Tested to 250 lbs. per leg. 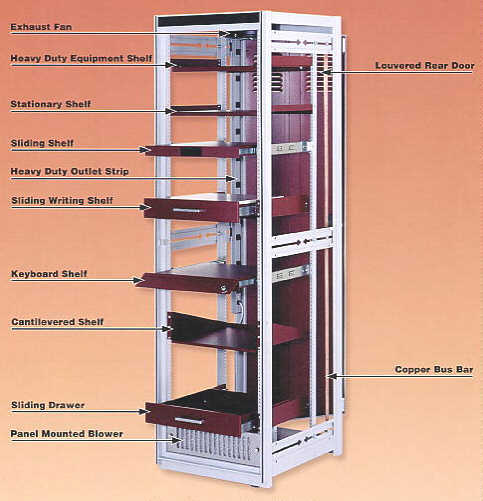 Welded, steel drawers are cradle mounted on full extension roller bearing slides with a disconnect feature. The suspension cradle mounts to the front panel mounting angles. Formica covered sliding shelves mount into cradle on full extension roller bearing slides with a disconnect feature. The cradle mounts to the front panel mounting angles. Shelves use 3 1/2 inch panel height. These pairs of extension bars mount to full depth of cabinet, extending one foot in front of cabinet to prevent tipping. (Catalog No. CA-5). Should be ordered with cabinet. For multi-bay and console units. All hardware supplied. Catalog Number: CGK-6 for ganging each additional standard frame. Catalog Number: CGK-7 for ganging one side of a wedge frame to a standard frame. Constructed of 16-gauge steel with a 5 1/4 inch hinged front panel. Top panel is 3 1/2 inches and hinges down when keyboard is in use. Supplied with a cylinder lock for securing in the closed position. Note:* Slides must be ordered separately. Constructed of 16-gauge steel. Utilizes 5 1/4 inches of panel space for mounting to front panel mounting angles. Constructed of 16-gauge steel. 1 3/4 inch front panel, flush pull, and supplied with all necessary mounting hardware.